Families Belong Together © 2018 Ian Pierce (Ekeko) / City of Philadelphia Mural Arts Program. 2536 North Front Street. Photo by Steve Weinik. Activism and different forms of art have long been intertwined. Song was used in protest by people who were enslaved to preserve culture, history and identity. Music continued to be utilized by various communities during the Civil Right Movement to express anger and resistance. Nowadays, songs are recorded by popular musicians to fundraise for people affected by natural disasters or acts of hate and violence. Other forms of art, like photography, painting, poetry and dance, have functioned in the same capacity as music, sometimes supporting a social justice movement, fighting against an entire institution, or simply documenting the culture. For many artists around the world, and especially in Philadelphia, art and activism have aimed to to better serve their communities, neighborhoods and cities. There’s the recent Mural Arts Philadelphia mural by artist Ian Pierce and local community members that takes on immigration and states “Families belong together - not in cages.” Another example is the Collective Conscious exhibit at the African American Museum in Philadelphia that features artists “who use their work to process or respond to the constantly changing socio-political and cultural landscape.” There are so many works of art in Philadelphia that represent the intersection of art and activism, and there are always new events that explore this juncture and dive deep into how all these movements influence art and vise versa. If you’re interested in art, activism and social justice, below are the events happening in Philadelphia and the surrounding area that explore these important topics. 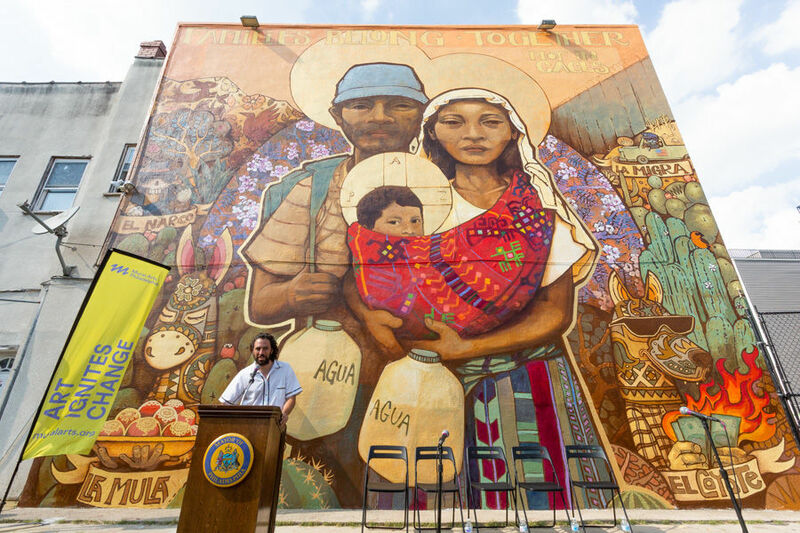 The photo in this editorial was provided by Philadelphia Mural Arts Program. Families Belong Together © 2018 Ian Pierce (Ekeko) / City of Philadelphia Mural Arts Program. 2536 North Front Street. Photo by Steve Weinik. Elizabeth Estrada is the digital communications coordinator at the Greater Philadelphia Cultural Alliance. She is an avid podcast listener, coffee-drinker and as of recently, a bicyclist. She loves stumbling across powerful murals and public art. You can follow her @thatswhateesaid.